This is my first attempt at a post, so please be gentle, even if you think it’s pants!!! 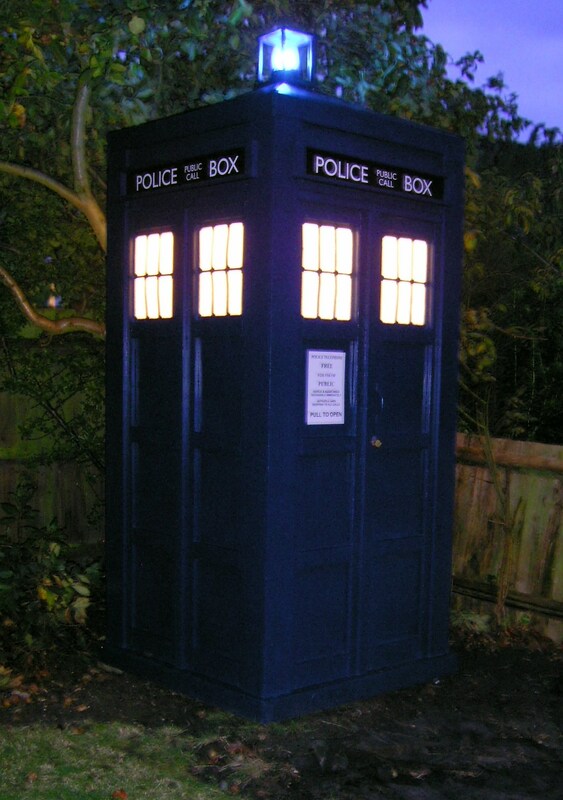 The creator asked me to post a photograph of my Tardis which currently sits in my back garden. It’s based on the Type 40 Mark 1 Time Capsule as used by the Doctor, who borrowed it on a permenant basis from his home world of Gallifrey…. You don’t need me to tell you that as you already know!! It resembles a 1963 Police Box which were situated practically on every street corner of London. I currently use mine for storage, you know things like my car, my motorcycle and various gardening furnature because its bigger on the inside!!! If you like this post I will happily do another going into more detail on the said Time Machine and other’s like it from Doctor Who. I await the feedback!! This entry was posted on Thursday, August 25th, 2011 at 3:02 PM	and tagged with BadWolf187, Dr Who, TARDIS and posted in Cool Stuff. You can follow any responses to this entry through the RSS 2.0 feed. OK, more pics of the inside “bigger” bit please? I would love to say I constructed it myself but it would be a lie. It was a prop from a stage show in south London of Doctor Who. I have a picture of it in situe. It’s an MDF and timber construction with a ply wood roof. It is extremely heavy it took six of us to get it over the fence into the garden. The roof needs some repair now as three winters haven’t been kind to it.